Through the kindness of a donor the Clarke Library recently received an early Central class ring, proudly emblazoned with the School’s founding year – 1891. Considering we are celebrating the 125th anniversary of Central’s founding this year, in 1892, the ring is something of an inconvenient artifact. It was hard to imagine, however, that someone would get something like the date the school was founded wrong in bronze. As it turns out Central has used a variety of dates regarding when the school was founded. Among the earliest documents in the CMU Archives it states clearly and repeatedly that the institution was founded in 1891. However in 1949 the State Board of Education, which at the time had administrative control of the School, decided that the institution was actually founded in 1892. But in solving one puzzle a new one is created: why does Central celebrate its birthday on September 13, rather than May 24? Although the Improvement Association’s stated goal was to found a University, the mechanism was not straightforward. It was, instead, a speculative real estate scheme. The Association bought a farm near the south end of Mt. Pleasant, set aside a portion of the farm to be the site of the new University, and divided the rest of the farm into 210 lots which it intended to sell. The founding of the University, or more properly the construction of a building to house the University on the land set aside for this purpose, was dependent on income received from the sale of the lots. If the real estate scheme didn’t work, there would be no building, and without the building “Normal University” would largely be an imaginary creature. The lots did, however, sell, and during the spring and early summer several milestones were met. One important milestone was signing a contract in June 1892 with Charles Bellows, who agreed to become principal of the new University and also recruit both faculty and students. However, much like selling lots to fund a University, hiring someone who agrees to find faculty and students is not exactly the same thing as having either of those essential components of any school. There was clearly a good deal of work to do during the summer months, and a lot that might go wrong. Bellows, however, was good to his word. September 13, 1892 was the first day of classes. The faculty had been assembled, as least a few students showed up on a rainy morning, and the business of education was begun. The choice of September 13 as CMU’s birthday is a bit arbitrary, but also very logical. And for the record, the Association held the groundbreaking ceremony for the promised building on September 19, 1892. Classes, which had begun a week earlier, had been convened in rented space located in downtown Mt. Pleasant. Groundbreaking was the capstone of the Association's work. It had raised the money needed to fund the school, recruited Charles Bellows to find faculty and students and run the new institution, and made good on the promise to construct a building for the school’s use. Classes moved to the new building when it was completed in 1893. Joel Stone, senior curator of the Detroit Historical Museum, spoke at the library on October 19. He discussed the Museum’s multi-year planning effort which resulted in the exhibit, Detroit 67: Perspectives. The exhibit takes the long view of the civil disturbance that swept Detroit in July 1967. It begins by looking at the complex factors that took place across metropolitan Detroit during the 50 years prior to 1967, reviews the unrest that occurred between July 23 and August 1, 1967 and ends by exploring the 50 years since 1967, detailing the progress the city has made as well the setbacks that have been encountered. Stone’s presentation did not comprehensively discuss this century-long history, but rather spoke about how the museum worked to tell the story of that week, what led to it, and the consequences of the events as that were felt then, and are still felt today. Over one hundred partners joined the museum staff to bring many perspectives into the exhibit. Stone shared in his presentation the tension of the discussions with partners. Everyone, for example remembered the “tanks,” even if in many cases they were not true tanks with a cannon mounted on a turret but an armored personnel carrier (APC). The distinction was not that important at the time in that they both were big metal machines, both were armed with machine guns, and both ran on tracks rather than tires. How partners remembered the tanks, though, varied dramatically. In a discussion about whether to include a tank in the exhibit three Black women sitting next to each other at one meeting encapsulated the raw emotion the vehicle inspired. The first completely opposed including a tank, noting passionately that they were the ultimate symbol of oppression. The second responded with equal passion that her parents loved having a tank on their street – it meant their home was safe from the many fires caused by arsonists. And the third woman, listening to the first two, said that if a tank got that kind of raw response from these two ladies, then it had to be in the exhibit – what else carried that kind of interpretative weight. An APC is in the exhibit – although after having found a real one and gotten into it the museum staff realized their initial idea of opening the back an allowing people to walk in was a claustrophobia attack waiting to happen. Thus the APC in the exhibit is “opened” with displays in the rear, and no admission into the interior. And there also were a few myths to dispel, including a handed-down memory of U.S. Army troops parachuting into Detroit in July 1967. The U.S. Army was sent to the city to help restore order, and because they were easily mobilized most of the federal troops sent were paratroopers. However they were flown to local airports where their plane landed and the soldiers got off the plane and onto busses, which drove them the last few miles into Detroit. Stone’s presentation offered an interesting an impressive window into how a contemporary exhibit on what remains a very controversial event can incorporate community viewpoints, serve as a springboard for discussion, and, one hopes, help create constructive dialog on topics that more often serve to divide rather than to heal. The leave taking was often harrowing and sometime heartbreaking. One interviewee spoke of how her husband got her out of the country, but stayed himself because of the obligation he felt to others. After reaching America, she received a few letters from her husband, before she eventually learned he had been executed. Others spoke of dangerous trips in unseaworthy, overcrowded boats and period of interment in countries such as Malaysia. The interviewees also spoke of their arrival, and the challenges they faced in a new land. One spoke of how she and her family were greeted at the airport by representatives of a local church who had “adopted” the family. They were taken from the airport to a furnished house that they were allowed to live in, with supper waiting for them on the table. Many of the interviewees told similar stories regarding the kindness they experienced in their first days in America. But however welcoming the local population was, the refugees had been uprooted from there former lives and placed in a completely new environment. There were, therefore, challenges. Things residents of Grand Rapids might easily take for granted could prove an obstacle for these newly arrived refugees. Everyone who arrived in the winter commented on the cold. One comical yet revealing story was about how early on one of the refugees needed to travel in town. He was shown where the bus stop was, told where he needed to get off, and warned that several different bus would come by and that he should wait for the number 4. This was good advice, but the morning he left his house it had snowed and the exterior numbers on the bus that drove past were unreadable. Without any English language skills he couldn’t ask the bus driver if this was the number 4 bus. After three bus passed he decided he would just have to take a chance, and got on the next bus. Inside, he saw it was indeed the number 4 bus, and thanked God. To a person each of the refugees worked very hard and succeeded in their new home. As Alan Headbloom pointed out, this is typical of refugees. Unlike other immigrants, who can always go home if things don’t work out, going home for these people could mean imprisonment or even death. They had no “plan B.” Making life work in America was the only option. In the last few minutes of the documentary the refugees were asked where, for them, is now “home.” Each answered the question in various ways, but each ended by saying “home” was now Michigan. In an era when immigration plays an important role in our national political discussion, Alan Headbloom’s documentary offers invaluable insights into the immigrant experience. For more information about the documentary visit Mr. Headbloom’s Facebook page, www.facebook.com/NewcomerLegacy. At its 2017 annual meeting the Historical Society of Michigan honored Le Roy Barnett with its Lifetime Achievement Award. Lee Barnett has regularly enhanced the documentary record of our state. Today Lee is retired after serving for 23 years as a reference archivist at the Archives of the State of Michigan. But during his career and archivist and continuing into the present, Lee has published hundreds of books and articles documenting literally all aspects of Michigan history. The Clarke Library’s connection with Lee is a deep one. Lee has donated over thirty feet of his documents and background files to the Clarke. As Clarke archivist Marian Matyn notes in her Collection Scope and Content Note, topics found in the papers include: “Michigan ash; railroads; highways; the Mackinac Bridge; music and people who sang or wrote songs about Michigan and/or cars; the longstanding oleo versus margarine debates, issues, advertisements, laws, and illegal sales; Agricultural Demonstration Trains of Michigan State University, 1906-1937; buying Michigan, 1795-1796; counties, name changes/considered creation of new counties; the history of county names; dandelions [as an emergency source of post-World War II rubber]; highway lighthouses [precursors to traffic lights]; lynchings; prisoners building Michigan roads during the 1920s; reflectors (roadside); roadside parks [Michigan had the first]; and stagecoaches. An addition in 2006 included the topics of: Broadcasting, Homestead Lands, Michiganders who went to Hollywood, Port Huron and Milwaukee Railroad, Sabbath Blue Laws, particularly in Ludington, and Swamp Lands, among others. Later additions include the topics of centroids, Iron Range and Huron Bay Railroad, Michigan ferries, Michigan’s population centers since statehood, and Oldsmar, Florida, harvesting deadheads (logs in rivers), LaChoy, and Michigan as a Commonwealth, David Ward, Deward (Mich.), and the Detroit and Charlevoix Railroad Company.” The complete finding aid describing his collection can be found at https://quod.lib.umich.edu/c/clarke/ehll--barnett?byte=485843;cginame=findaid-idx;focusrgn=summaryinfo;id=navbarbrowselink;subview=standard;view=reslist. When not publishing new works or shuttling donations from his home to the Clarke Library, Lee also regularly looks at dealer catalogs and other sources of historically related material and regularly sends along helpful notes about what he has found. A number of acquisitions found their way into the Clarke stacks because of a helpful note from Lee, making me aware of their availability. Lee Barnett has been a friend of the Clarke, and more importantly an outstanding contributor to the body of knowledge about our state. 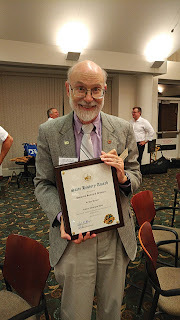 I am delighted that the Historical Society of Michigan has recognized his work. To be honest, I had never heard of Ralph Connable, but based on a promise to “find out what I could and get back to you” I began to do my homework. It was worth the effort. Connable was a fascinating, Michigan-based, character. Connable’s Hemingway connection was clear, and relatively brief. In December 1919 Harriet Connable, Ralph’s spouse, happened to hear Ernest Hemingway talk at the Petoskey Public Library. She took a liking to the young man, deciding he would be just the thing to introduce the Connable’s somewhat sickly son to the joys of physical activity. Hemingway was hired to spend the winter of 1920-21 in Toronto with the Connable’s son, while the rest of the family enjoyed an extended Florida vacation. The job was not particularly demanding and the Connables had also introduced Hemingway to the editors at the Toronto Star, for whom he started to write – eventually publishing 172 pieces in the Star over a four year period, many of them while in Paris. That story is well told in the literature printed about Ernest Hemingway. But who was Ralph Connable? I spent an afternoon looking into the question and found one of those stories that had to be real, since no one would believe it were it put into a work of fiction. Born in 1873 in Petoskey, Ralph Connable could politely be referred to as a gentleman who engaged in many careers, primarily because he failed in the one preceding his move to the next. His father was postmaster in Petoskey and relatively prosperous – a blessing that seems to have save Connable several times. Connable attended Albion College’s Preparatory School where, by his own admission, his major interest was in stud poker. His scholarly career at Albion was short-lived. At 15, Connable’s father gave his son his first job -- charge of the stationary counter in the post office, a private concern for which the boy was to receive 10 percent of sales as his salary. Connable himself, in an amusing autobiography from which most of this account is taken, admitted that had he been less interested in dime novels and more willing to serve his customers this arrangement would have worked out well. The counter, after all, was the only place to buy stationary in town. Unfortunately, Connable was much more interested in reading dime novels than the business, and saw no reason why a customer shouldn’t wait to be helped until he finished reading a sentence, or a paragraph, or maybe a page, or a bit more of the book. Business did not go well. This was a pattern that was repeated many times. Next, he and his brothers got involved in fishing. Commercial fishing was a profitable business. With three steam tugs and almost 500 miles of gill nets, it seemed the firm’s future was bright. However the business did not go well. With little prospect of making a go of fishing on the Great Lakes, Connable hit upon a new scheme – going to northern Minnesota to make caviar from sturgeon eggs. After spending a fall fortune to learn how to make caviar and a year in Minnesota he came to the sad realization that there were too few sturgeon in the area he had selected to make money in caviar. Again out of a job, Connable found work with the Booth Packing Company of Chicago, acting as their agent in scouting potential fishing sites in Minnesota. This too did not amount to much, but it did introduce him to people in Chicago, which would play an important role in his future. Leaving Minnesota and the Booth Packing Company, and returning to Chicago, Connable found work at an “Edison Phonograph Co.” on State St. in the Loop. The emporium had 30 or so phonographs where ”drunks with ‘sporting ladies’” would pay to hear songs played. Told he needed to go west for health reasons, he raised the money to buy two “Kinetoscope Fight Machines,” and shipped them to Colorado. He was assured by the company his would be the first “moving images” west of Chicago, an assurance he decided was not worth much when he arrived in Denver to discover someone had preceded him by about a month, with the same machines. Nevertheless by taking his machines to various mining towns he managed to make some profit. But in the end he shipped the machines back to Chicago and in 1895 returned to that city. Looking for a line of work that would not be seasonal, he learned to run a laundry business by volunteering to work for free. After three weeks of “training”, he discovered that the owner of Petoskey’s White Swan Laundry was dead – and the business for sale. With a $500 loan from his father and several notes to various creditors the White Swan Laundry became his. He learned two things running the laundry. Business was steady during the tourist season, but come October it slumped badly. The second thing he learned was that, when the business burned one night, the insurance money he planned to use to rebuild it went instead to the various creditors whose notes he had signed. With the help of his father he ended up managing a bookstore in Traverse City. 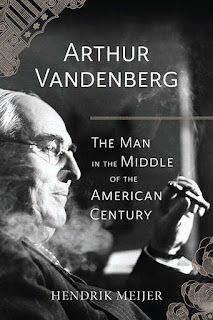 Having read little since those dime novels many years earlier Connable nevertheless was undeterred, writing that “Being completely uncultured adds a degree of assurance that spells success in any line.” While running the bookstore he first encountered the 5 & 10 business. Travelling to Chicago he bought a small stock of items from Siebert, Good & Company, which ran several large 5 & 10 stores. The five and dime business sold discounted general merchandise, generally as the name implied for either a nickel or a dime. Connable’s 5 & 10 business did well and soon proved much more profitable than the book store, so profitable the store was sold, and the new owner installed his son as the new manager. As a substitute, Connable was offered the opportunity to manage another store in Kalamazoo, but with the sum of $2.85 in his pocket he turned down the offer to return to Petoskey. In 1900 he decided to follow up on a casual remark made by Daniel Good, from whom he had bought that small stock of merchandise, that he would hire him should the opportunity arise. Good was indeed good to his word – and employed Connable at the company’s State St. store in Chicago at a salary of $12 a week. After about seven weeks Connable went back to Mr. Good and announced he was ready to become a store manager. The manager of the branch store in Bloomington, Illinois had just been fired – and Mr. Good gave Connable that job. Given Connable’s past history, unsurprisingly things went poorly. The store burned. But something magical happened. Connable managed to persuade the more than peculiar owner of the property to allow him to rebuild on the site, something Mr. Good had been unable to accomplish. Good was so impressed Connable was recalled to Chicago to serve as Good’s assistant and general buyer for the chain’s nine stores – at the generous pay of $1,800 a year. Within six months Connable had proved so adept at the business his pay was raised to $3,600 a year. Siebert Good & Company was first bought out by a company headquartered in Buffalo, New York, which in 1911 subsequently merged with several other 5 & 10 chains to form the 900 store strong Woolworth Company. The Woolworth Company wasn’t quite sure what to do with Connable, so they sent him to run their eleven stores in Canada. The stores were poorly managed, something Connable addressed quickly. They were also buying most of their stock in the United States, and as a result paying a 40 percent tariff to import the goods into Canada. Connable turned to domestic Canadian suppliers for most of his needs and avoided the 40 percent tariff – a change that made the stores profit soar. Connable was opening eight to ten new stores a year, but was convinced that the biggest profits were to be made in Canada’s far west. Investors however balked at the high overhead Western stores would require. Eventually Connable was given permission to open three as an experiment, with the first in Calgary. After the store’s first month, Connable was given authority to open stores wherever he wanted. In 1915 he was made president of Woolworth - Canada. In 1926 he retired from Woolworth, a wealthy man despite the many business failures during his younger years. Somewhere in this long career Connable developed a love for golf. He thought of it both as the perfect recreation for he and his staff, and a very, very good way to seal deals with suppliers. Connable’s love of the game, was such that he was responsible for the construction of Toronto’s earliest public golf course, sharing his passion with those unable to join a country club, which previously was the only way one gained access to the links. Connable was also an inveterate practical joker. 'His favorite escapade was to dress like a woman and walk into the men's locker room of the staid Lambton Golf Club. While men shouted and tried to hide behind doors, Connable would whisper, "I'm looking for my gentleman friend." Connable’s connection to Hemingway was brief. His connection to Michigan much stronger. And his story truly one of persistence in the face of repeated failure, eventually leading to finding his way to great success. It is amazing what kind of story can be found answering a simply question. With the help of the Robert and Susan Clarke endowment the Clarke Historical Library will again this year sponsor a mini-grant competition that will make it possible to bring all or part of a Michigan community’s historic newspaper online. The DigMichNews grant will allow the Clarke Library to scan and place online up to 9,000 pages of a previously microfilmed newspaper, or microfilm, scan, and place online up to 4,500 pages of hard copy newspaper. Applications for the program can be found on the Clarke Library website, https://www.cmich.edu/library/clarke/digmichnewsgrant/Pages/Grant.aspx . Got your community’s application in today. The following year, the second homecoming was planned. Among the highlights of the Friday-night pep rally, was “the traditional Central Normal dragon,” which “wound its way among the crowd encircling the bonfire while the red lights shooting out from its gaping mouth were portents of the ordeal that Albion must undergo on the morrow.” The dragon also made an appearance at halftime the following day when the Central team held the strong Albion squad to a draw. 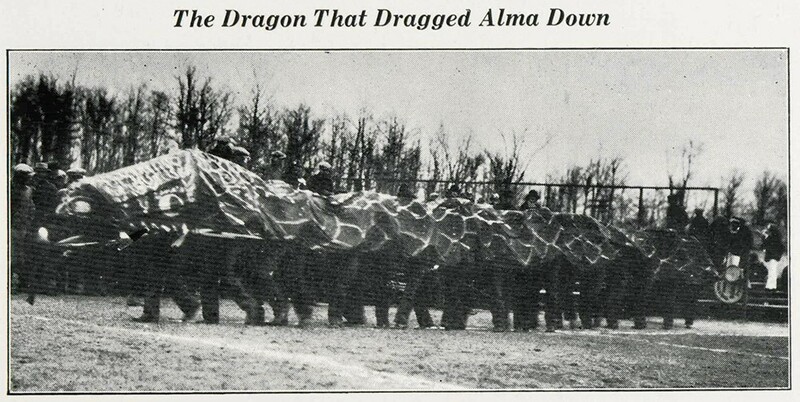 Clearly the fire-breathing dragon had become a homecoming tradition. 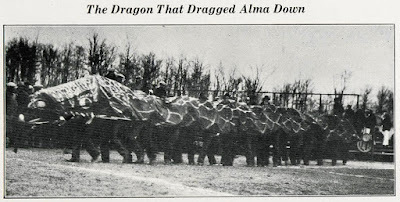 It’s not often that a school’s Homecoming tradition gives rise to a team mascot, but such is the case for Central’s short-lived fire-breathing dragon that rallied students and intimidated opponents. This week is Homecoming week at Central. One of the long-standing traditions has been the selection of students to represent the University for Homecoming. Since 1997, these students have been called Ambassadors and two are bestowed the honor of “Gold Ambassadors.” Before that, these students were referred to as Homecoming Queen and King and the Homecoming Court. And before 1982, there was no King, only a Homecoming Queen and her court -- a tradition stretching back to 1946. Sometimes the competition for Homecoming Court is so memorable that it lives on in infamy for decades. Such is the case for the Homecoming Queen race of 1950. As far as the public was concerned, everything seemed typical as of Tuesday, October 3, 1950. The October 4 CM Life reported that there were seven candidates in the race for Homecoming Queen: Doris, Katie, Jeanne, Mary, Marilyn, Marie, and Mary Kay. The young women were to participate in the Queen’s candidacy program the evening of October 4. Then, a campus-wide vote would take place the following day to name the Queen that would preside over Homecoming weekend - October 13, 14, and 15. Everything looked like it was moving smoothly, but something was afoot. In the lead up to Homecoming, some of the young men from Ronan Hall felt that the campus environment was a little dull and spirit was lacking among Central students. A young freshman named Edward Miller decided to be the spark that would make things a little more interesting. The day before the Queen’s candidacy, rumors began swirling about Mr. Miller’s plan. Some of the Ronanites, as they were called, began a publicity campaign to let people know that the Homecoming Queen race was about to get shaken up. If people hadn’t heard the rumblings of the plan, they only had to wait until the Queen’s candidacy program on the evening of October 4. As the CM Life reported the following week, even before MC Bob Johnson could finish making the announcement of a new contender - a “dark horse” as he put it – the crowd started in: “We want Ed-na.” The curtains parted and there, before a packed Warriner Auditorium, stood Edna Miller. The young Ronanite from Saginaw had been transformed into a “gorgeous” Homecoming Queen candidate. As the CM Life put it: “She smiled and hearts throbbed. She winked, and cheers rose. She threw a kiss, and the men swooned." Edna certainly gave the other seven candidates a run for their money. But alas, royal status was not to be Edna’s. For unknown reasons, she was disqualified from the competition. Being kicked out of the competition did not stop Edna from attempting to conquer campus. She appeared as an unofficial entry in the parade atop a throne of her own “with fifteen able men drawing her through the parade,” as the CM Life reported it. Edna Miller’s campaign to take the title failed - Katie Flynn was named Homecoming Queen that year. But Ed Miller’s campaign to liven up the Homecoming events was a resounding success. This blog post originally appeared in a slightly different form October 14, 2013. It is one in a series of information detailing the history of Central Michigan University in celebration of the 125th Anniversary of the institution. Be sure to check out the official 125th Anniversary website – http://anniversary.cmich.edu – and the Clarke’s fall exhibit, on display through February 2018, for more great stories. Homecoming, that wonderful autumn rite, tends to coincide with the blooming of chrysanthemums. So, it goes without saying that deep maroon and vibrant gold mums are the perfect match for the festivities at Central each year. In the early 1930s, less than ten years after Homecoming football was a part of the fall social calendar (the first Homecoming football game was in 1924), flower shops around Mount Pleasant began taking out advertisements in the local newspapers announcing, “Mums for Homecoming.” By 1936, a student group, the Lucy A. Sloan Literary Society (later named Alpha Sigma Tau Sorority), began selling “mums” during the Homecoming celebrations for ten cents each as a fundraising activity. The "mums" were not actually flowers, but crepe paper blossoms in “rust and yellow” colors. By the 1960s, things had changed and “Homecoming Mums” became a highlight of the festivities. Sororities took responsibility for selling the mums, which were real blooms and often decorated with the Greek letters of fraternities and sororities across campus or a “C” for Central. As time moved on and the 1960s turned to the 1970s, student organizations stopped selling mums. Local florists took their place, selling mums to current members of the Central community and the alumni who came back for Homecoming. The florists continued advertising “Mums for Homecoming” in the student newspaper through the mid-1980s, but the tradition was never as vibrant as it was during the 1960s. Mums planted on campus, 2013. Image courtesy of Steve Jessmore. 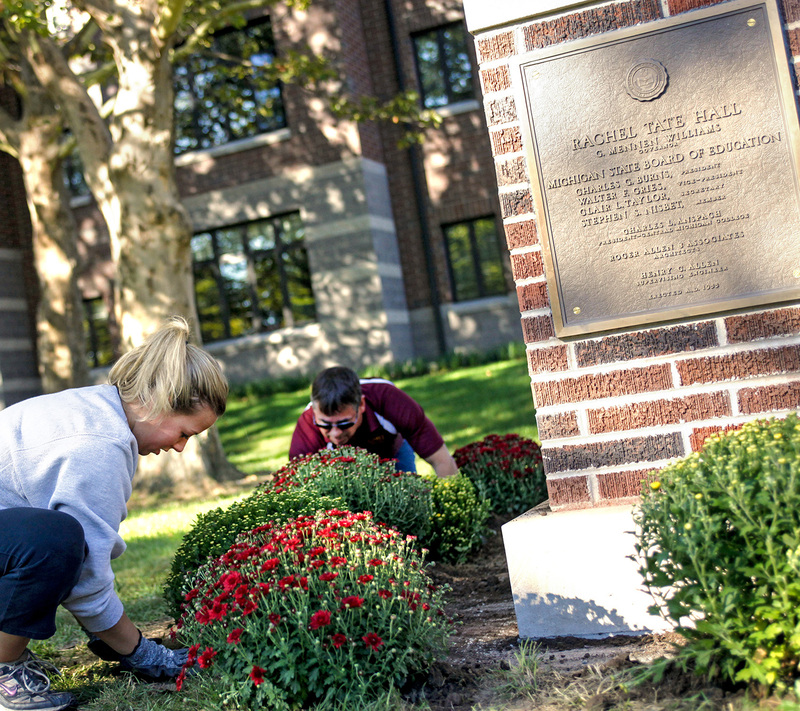 Today, even though they are not sold as part of the plethora of Homecoming happenings, CMU’s campus is awash in “rust and yellow” chrysanthemums – a symbol of Central’s Homecoming dating back nearly 90 years! We are all familiar with the excitement that Homecoming week brings to campus. Students have fun building up to Homecoming weekend by decorating their residences or joining in on the Medallion Hunt. Student organizations put the finishing touches on their floats. Alumni and CMU fans begin gathering all the maroon and gold they can find to wear for game day. The people of Mount Pleasant enjoy the parade in the morning, the tailgating and football game in the afternoon, and dances and other social events later on. These tend to be the usual festivities planned for the Homecoming, except one year, 1971, when things were shaken up. The Student Alumni Association decided to get rid of the parades, dances, residence hall decorations, and even the Homecoming court. It was reported that students didn’t particularly care about the court and that there were simply not enough parade participants to make that tradition worthwhile. The Student Alumni Association wanted to try something new that all students and alumni could enjoy, so they organized a carnival, a bazaar, and a "style show" instead. The only traditional aspects they held onto were the pep rally, the snake dance, and the football game. But this idea did not turn out to be such a hit. According to an editorial in CM Life following Homecoming weekend, returning alumni were unimpressed with “coming home” to a ferris wheel ride, and many people felt there was a lack of school spirit. They suggested that the next time big changes were to be made for an event such as Homecoming, those changes should be voted on by the student body to see just how many people care what weekend festivities might be enjoyed. This would seem like a fair compromise, but in a rebuttal editorial post published two days later, the Co-chairmen of the Homecoming Steering Committee had many answers and explanations for the series of complaints. They felt that the Homecoming queen did not really represent CMU in its entirety, and that Miss CMU, who took the place of the queen and her court, would be a better fit. They also found that “at least 50 groups requested to build a booth for the bazaar,” which seemed to mean that there was more interest shown for the bazaar than previous parades. The Homecoming Steering Committee also noted that they did not intend for students to refrain from decorating their dorms, only that students should decorate lightly and donate to charity the rest of the money that they normally would have spent on decorations. The experiment of the alternative Homecoming of 1971 was a one-time event that did not quite resonate with all the attendees. 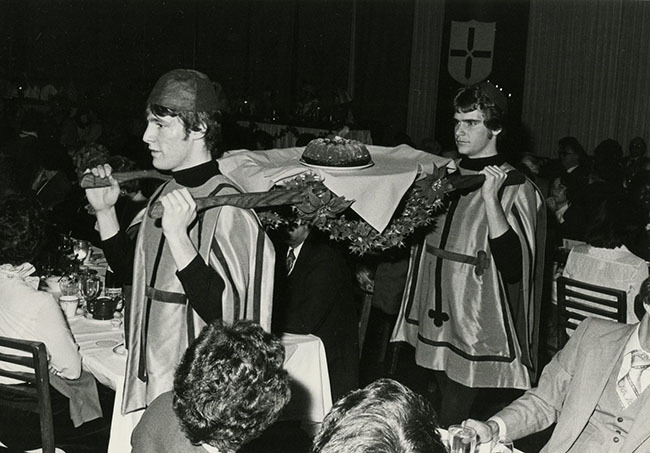 But the spirit of updating some of the traditions of Homecoming to better reflect the University has lived on. 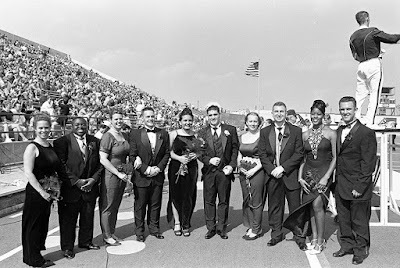 Since that time, the Homecoming Ambassadors have replaced the queen and her court, the dances are not as popular as they once were, and the Medallion Hunt, started in 2003, as well as the cardboard boat race, started in 1998, have become campus favorites. 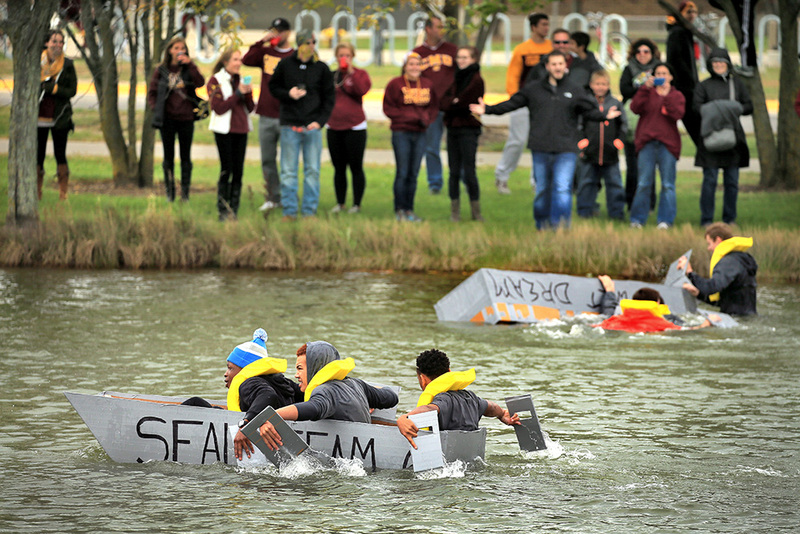 As long as Homecoming is a tradition at CMU, there will always be students and alumni reinventing the traditions to make them their own. This blog post originally appeared in a slightly different form October 2, 2014. 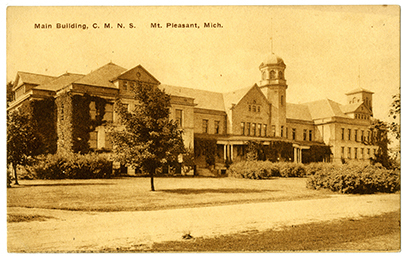 It is one in a series of information detailing the history of Central Michigan University in celebration of the 125th Anniversary of the institution. Be sure to check out the official 125th Anniversary website – http://anniversary.cmich.edu – and the Clarke’s fall exhibit, on display through February 2018, for more great stories. Each Fall the Friends of the Veterans Memorial Library in Mt. Pleasant hold an extensive book sale at the Library where attendees find a great selection of “gently-used” books, videos and CD’s for you to choose from. The Friends Book Sale obtains its written, visual and audio materials through generous donations by library patrons and the general public. This year the sale will take place Thursday, October 5 from 10:00 a.m. until 6:30 p.m., Friday October 6 from 10:00 a.m. until 4:00 p.m., and Saturday October 7 from 10:00 a.m. until 2:00 p.m. Saturday is bargain day when you can buy a bag of books for only two dollars. Besides helping the Friends raise money to support our community’s local public library, the Clarke Library owes a special debt to the organization. Each year the Friends give us a call and invites the Clarke staff to visit the book sale a day or two before the public is invited, allowing us to look through and take without charge any of the donated books that will enhance the Clarke Library’s book collection. I spent much of Tuesday morning pouring over titles and walked away with seventy titles. A few samples of the treasures I brought back to the Clarke include, Splittin’ the Mitten: Get Your Kicks on Michigan’s Route 66; Better Made in Michigan: The Salty Story of Detroit’s Best Chip; Aloft: Bay County Michigan Pioneer Flyers, Flights, & Airfields, 1912-1962; and the children’s book Stephen and the Beetle by award-winning Mexican author Jorge Lujan. My thanks to the Friends of the Veterans Library for helping us expand the collection. If you have a little time and need a good book to own, drop by the Veterans Library at 301 S. University Ave., Mount Pleasant, Thursday, Friday or Saturday. I left a few good ones behind for you! On Wednesday, October 4, archivists across the country will participate in the Society of American Archivists' "Ask an Archivist Day" event. Archivists will answer questions about what we do, how people can preserve their documents, how people can get involved with archives, and tons of other questions that archivists are (hopefully) fully-equipped to answer. 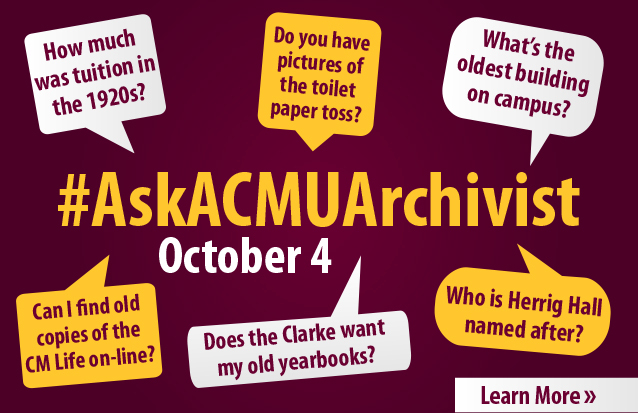 Here at the Clarke, we are going to answer your questions about CMU history for Ask an Archivist Day. In addition to our exhibit and our monthly brown bag lunch series, "Ask a CMU Archivist" Day is a way of celebrating the 125th anniversary of the founding of Central Michigan University. We will use this day to answer questions about CMU history and what it is that we do in the Clarke to collect and preserve that history and then make it available to anyone and everyone. To participate, simply send a question on Twitter or Facebook using the hashtag #AskACMUArchivist. You can also send questions to the Clarke's e-mail using the subject "Ask a CMU Archivist." The archivists and staff at the Clarke will work throughout the day answering your questions and making those answers available to the world via our Twitter and Facebook pages. For more information, visit the "Ask a CMU Archivist" web page. On Tuesday September 19, Roderick McGillis delivered the annual David and Eunice Sutherland Burgess Endowed Lecture to a large group of students, faculty, and other guests. A distinguished senior scholar of children’s literature Dr. McGillis presented a fascinating history of the development of children’s literature as an academic discipline, and ended his presentation by sharing one of his many stories; something he is justly famous for. When Doctor McGillis began his career children’s literature was not taken very seriously. Books for children were considered nothing more than brightly illustrated and cleverly written teaching tools. The point of children’s literature was simply to educate children, with words and illustration having no real importance other than to keep the child’s interest. “Real literature,” the books English professors read, discussed, argued over, and eventually taught to their students, was written by adults for adults. Over his long career Dr. McGillis struggled to help create professional organizations dedicated to children’s works, a professional discourse about children’s books, and to make those organizations and that discourse a recognized and accepted part of literary study. His presentation talked about the development of these goals, and contained more than a little concern that even today children’s literature is still dismissed by some “serious” academics as beneath their concern. But today those who dismiss children’s literature as a mere trifle are in the minority. It was a presentation that captured the development and change of a field by one of the individuals deeply responsible for that development and change, offering insight not only into what happened, but more importantly why it happened. But Doctor McGillis is also a well-known story teller, who proved the acclaim he has received for his ability in the field with a wonderful tale to end the evening. I cannot do the story justice, so let me simply say it was about his relationship with his grandmother, Grandma Burchill, how she claimed to him she was always up first in their house because she awoken by “the crack of dawn,” and that someday, when she died and no longer could beat him into the kitchen, she would be sure that he too knew the secret of hearing it. True to her word, the morning after she died, at first light, “Roddie” heard the crack. Is the story true? As Professor McGillis reflects here, https://www.scribd.com/document/56737932/The-Myth-of-Freedom it is a story he first heard someone else tell, over twenty years ago. He retells it placed in his own childhood home, with his own Grandmother, as it would have happened for him. On September 13 Professors Jay Martin and Brittany Fremion opened the Clarke’s current exhibit celebrating the University’s 125th anniversary by sharing some of the results of an oral history project with CMU students, past and present, that they have been conducting. Their presentation offered insights into why students come to CMU, their experience on campus, and their views about the institution. One of the many interesting points made in the presentation was on the importance of mentorship. Two stories told by individuals who attended CMU in the 1950s made this point vividly. Jack was not of a mind to enter the Service so one evening his father walked over to President Anspach’s house (which is today the Alumni Center) and knocked on the door. Anspach answered and the two men had a discussion about Jack, which ended with Anspach promising to look into the boy’s case. After reviewing transcripts and talking to his former teachers at Central, Anspach called Jack to his office, and told him he was reversing the decision of the Admission Committee and admitted Jack to Central. As it turned out, Anspach did this a few times every year – using his judgement to admit a student who he thought had the talent to succeed, but not the background to pass muster with the admission committee. As one of “Charley’s boys”, Harkins would go on to obtain both a bachelor’s and master’s degree from Central, become very successful as a local Mt. Pleasant business person, and become a generous benefactor to both the school and the community. Walter Beach was a talented football player from Pontiac who was being recruited by Michigan, Michigan State, and Central. In the end he came to Central because, as he told it in the interview that was shared, his mother decided that Central’s football coach, Bill Kelly, was an “honorable man” who would do right by her son. Kelly would quickly prove her right. In the first few days of practice Kelly’s assistant coaches organized the squad into four practice teams, with Beach always being placed on the fourth team with the poorest prospects. Kelly, knowing Beach’s potential, kept moving Beach to the first team, only to have the assistant coaches put Beach on the fourth team the next day. After a few days of this, Kelly called a team meeting of coaches and players. He announced by name who he expected on his first team at practice – Beach among them. The point could not have been made more clearly – judge Beach by his talent, not his color. It was a lesson the NFL had yet to learn. Beach would go on to a career in the NFL, shortened because he was considered a troublemaker. In 1961 when the Boston Patriots went to New Orleans for a pre-season game the team was housed in a luxury hotel – except for Black players who the facility would not accommodate. Black players were to be housed with Black families in the community. Beach would have none of it, and made the decision to fly down to New Orleans on the day of the game, play, and then fly back to Boston that evening. Boston’s coach, Mike Holovak, decided this was unacceptable behavior, and cut Beach from the team the day after the game. In 1963, while working as an elementary school teacher back in Pontiac, he was picked up as a free agent by the Cleveland Browns. Just before the 1964 season was to begin, he was suddenly cut from the team. He was packing his bags for the drive back to Pontiac when Jim Brown, then Cleveland’s outstanding star player and a man who recognized Beach’s talent, told Beach to wait a few minutes before leaving camp. Brown went to talk to management. Management never apologized for the “mix-up”, but Beach was back on the team. With his help Cleveland would win the 1964 NFL championship. However when Brown retired Beach knew his days with Cleveland were numbered. He was quickly fired. In 1967 Beach would be present at one of the most iconic moments of sports history. Jim Brown asked him to come to a meeting where several Black athletes would gather to publicly support world champion heavy weight boxer Muhammad Ali, who had announced he was a conscientious objector to the Vietnam War and had refused to be inducted into the military. Beach’s words, while true, understate the public importance of the moment and the risk those who participated took, because of the widespread publicity received when a group of Black men, who also were a stellar assembly of athletes, publicly took a moral stand to support Ali. The people who made Central was it is today are both the students who attended here, and the faculty and staff who helped them achieve their dreams. There stories were an integral part of Professors Martin and Fremion’s presentation, and is part of what we celebrate this anniversary year. The student newspaper CM Life and its predecessors have been a part of the CMU campus since 1919. Recently additional issues have been brought online in Clarke Historical Library's digital repository, expanding the run up through June, 2016. The preservation microfilming unit of Clarke first brought issues online back in 2013 including Central Normal Life (1919-1927), Central State Life (1927-41), and Central Michigan Life (1941-98). This was accomplished by taking microfilmed issues of the newspapers through the scanning process in order to digitize them. Now you can find all of the digitized issues available via the CMU Digital Collections. Whether you do a single search that covers the entire run or zero in on a time period, each issue appears as an individual PDF file which presents the newspaper exactly as published. Issues can be searched individually too. Additionally, the page content pane displays plain text, which aids researchers with transcriptions. The student newspaper project was the first newspaper digitization project undertaken by the Clarke. Since the original project in 2013, upgraded software provides an improved user experience to CMU digital collections which include Digital Michigan Newspapers, the Digital Michigan Newspaper Portal, CMU History, CMU Scholarly & Creative Works, Clarke Digital Collections, and the Historical Soo Locks Images. By hosting the newspaper collection, Clarke qualified for participation in the National Digital Newspaper Project, a partnership between the Library of Congress and the National Endowment for the Humanities. With 1,714 newly added issues including 14,700 pages, CMU's recent past is a near as your keyboard. 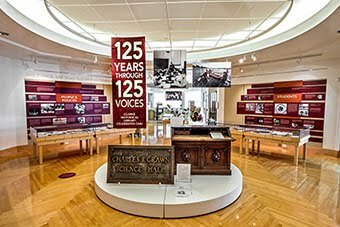 August 28th we began the process of installing our Fall exhibit, celebrating CMU’s 125th anniversary by presenting the voices of 125 people who have helped make that history happen. Installing a new exhibit is always an exciting moment, but also a bittersweet one. Before the new exhibit can go up, the existing exhibit comes down. I came into the library a few minutes early on the 28th, for a final chance to reflect on “As Remote as the Moon: The Soo Locks in Photos.” Every exhibit has its joys and triumphs, its trials and tribulations, and the Soo Locks exhibit was no different. There were carefully planned components and last minute decisions, usually the result of something not working quite the way everyone thought it would. But on the last morning every exhibit takes on a bit of nostalgia. All those moments of joy and concern come together to create a complicated quilt of emotion and remembrance. What I remember most are the people who made the exhibit come to life. Michelle Briggs, the U.S Army Corps of Engineers Park Ranger at the Soo, who made the exhibit possible with a phone call asking the Clarke staff to come up to the Locks and see if we could work out a plan to deal with the historic records stored there by the USACE. She also gave a wonderful presentation to open the exhibit in 2017. There is a good reason the Soo Locks Visitor Center is worth the visit – Michelle. Bryan Whitledge who, when the Corps of Engineers decreed that the glass plate negatives would not come to us for scanning, made the long trip to the Soo (in February) to spend several weeks on the third floor of the Locks Administration Building. He worked in a building designed to keep its inhabitants warm no matter what the weather – so warm some days Bryan worked in a t-shirt and shorts. Bryan kept three scanners running constantly, and still found time to puzzle together the occasional shattered negative. Janet Danek, the Libraries Exhibits & Projects Coordinator, a title that ignores the tremendous work she performs in drawing up the plans for, and then installing, each new exhibit. Every exhibit tells a story, and Janet is the person who makes the story come to life. She also directs a small army of students and volunteers who seem to arrive from everywhere to help install the nearly complete exhibit. Especially noteworthy are Peggy Brisbane and Sally Rose, who regularly make installation easier by giving hours of their time over the course of a few days. Working with Janet is Rebecca Zeiss. For years, Rebecca has created the panels that are placed on the walls. In the past several years she has taken Janet’s ideas and shaped them into the extraordinary display pieces that we place up for the public to see. Over the years, Rebecca has made every topic work – an accomplishment worth noting since some of the source material given her is less than visually stunning: way, way less. Susan Paton, the assistant editor of the Michigan Historical Review, also has her work interrupted by an exhibit. Among the challenges in any exhibit are linguistic concerns– from subject-verb agreement to commas (and the occasional, “what on earth are you trying to say?”) – concerns Susan regularly helps us resolve. Although I dread of those fateful words spoken after an exhibition is supposedly complete, “you need to read this,” the concern is considerably lessened by Susan’s good work. Each exhibit has a person or two who lends us wonderful treasures that bring the exhibit to life in ways the Library’s own collection could not. The Soo Locks show was no different. Gary Skory, director of the Midland County Historical Society, has loved the Locks and collected all sorts of tourist items, from pieces of tourist china to restaurant place mats. His loaned material helped us tell the story of the tourist industry that has developed around the Soo Locks in a way that we simply could not have accomplished without his help. And I would be terribly remiss if I also didn’t mention the many student employees who make exhibits happen. Drake Smarch, who works with Janet Danek, becomes a regular part of our staff during exhibit installation. Clarke student employees are pulled from their regular assignments for all sorts of help. Sometimes what they do may not feel important to them – but it is critical. Without their help we simply could not take down one exhibit and put up another. I hope our student employees, who don’t get much glory for their help, realize how deeply their contribution is appreciated. Thank you, everyone, for making Clarke exhibits so memorable. I will miss the Soo Locks show, but I look forward to the exhibit celebrating the University's 125th anniversary, which opens September 13th. In September 1923, the students of the Central Normal College were hustling around in a frenzied attempt to register for classes (Central Normal Life, 9/25/1923, p. 2). The only peace to be had on campus was coming from the newly-established marching band. Before ever taking the football field to entertain during a game, the band was given the duty of lightening the atmosphere and reminding students that their first days in Mount Pleasant were the start of an exciting chapter of their lives. It would be two months before the marching band would have their maroon and gold uniforms and would take the field supporting the effort of the players on the gridiron at an away game against Alma on November 24. Since that time, the Marching Band has been a fixture of the fall. More than 50 years after their first appearance, the Marching Chips were there in 1974 as the football team took part in the biggest game in Central's history to that point, the Camellia Bowl, otherwise known as the Division II National Championship. 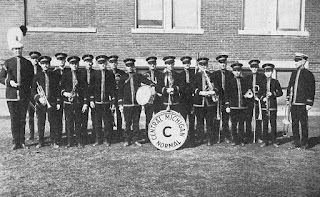 Because the University was able to offer only $17,000 of the $200,000 needed to send the band to California, a little help was needed to send the band out west. Clarence Tuma led a community fundraising campaign that raised the additional money. Tuma also had a final surprise for the band. Coming back to the present day, students new and old will be moving to Mount Pleasant in the coming days. They will be buying books, getting their residence halls and apartments in order, and catching up with friends after three months of summer vacation. 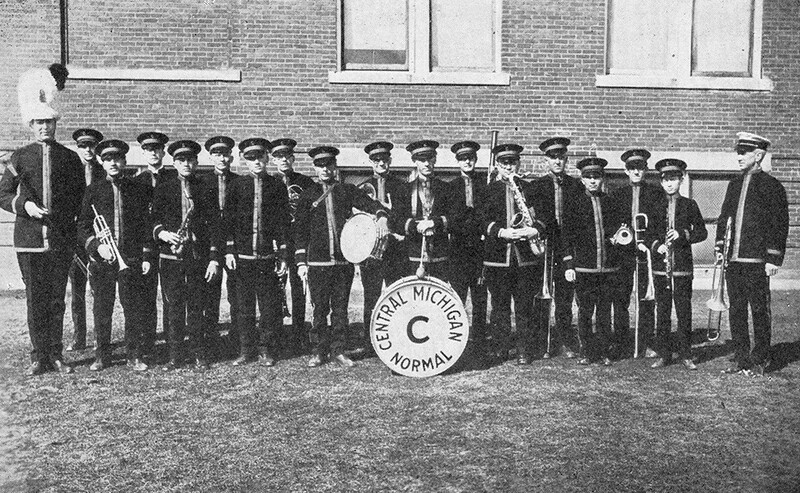 All the while, just like 94 years ago, the CMU marching band will be heard in the background, lightening the atmosphere during an otherwise chaotic time. CMU’s first football game, a clash with Rhode Island on Thursday, August 31, is just around the corner and the football team has been putting in hours of hard work on the practice field. But the football players aren’t the only ones honing their skills daily in preparation of the opening kickoff. During band week, which happens right before the start of classes, the Marching Chips are on the practice field all day, every day, whether in the blazing heat or the pouring rain. 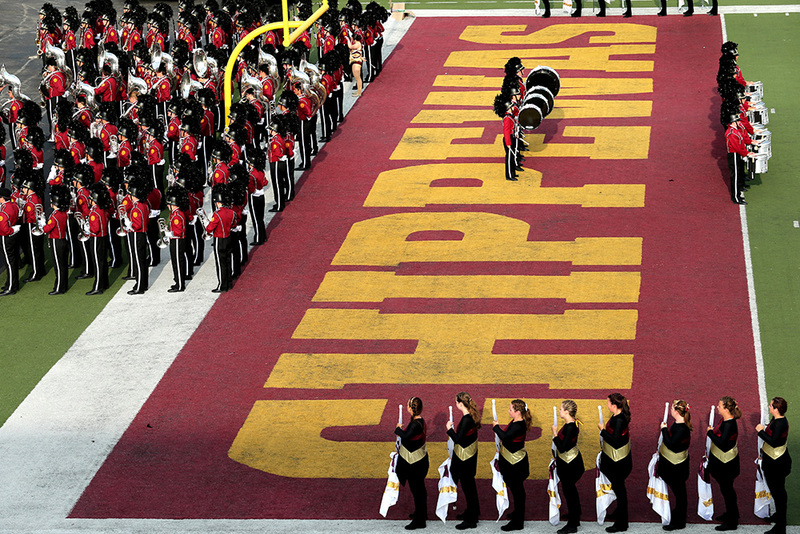 Throughout campus, the Marching Chips work on the songs and routines that will be on display for thousands of fans throughout the fall. The cadence of the drums can be felt across the Warriner Mall, the trumpets blare the high notes that will be the highlight of their performances, and the members of the woodwinds work in numbers to create big volume that will support the whole band. All of these musicians put in hours of work to learn about eight songs for football halftime shows in addition to the dozens of pregame tunes, stand times, and of course, the CMU Fight Song. The work doesn’t stop after band week. 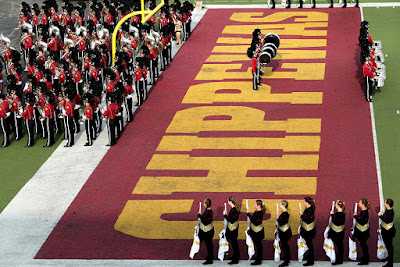 It should be remembered that the members of the Marching Chips are first and foremost students at CMU. Once classes start, many of the music majors will be taking ten or more classes along with their marching band duties, which includes practicing a few hours each afternoon, except for game days when some sections begin practice before 7:00 am. Graduate students and senior section leaders will help the mostly freshman marchers keep each foot together and each note in sync until the formations are performed to perfection. And what does all of this hard work bring? Well just like in 1923, it brings cheer to the students of CMU when they need an upbeat song to get them through the day. Of course, it brings life to football games and the annual homecoming parade. It brings traditions that have been handed down through generations of Marching Chips. Finally, for the musicians who are a part of the Central Marching Band, they earn a wealth of experiences, they garner a sense of pride in persevering to accomplish something magnificent, and they make memories that will last a lifetime. This blog post originally appeared in a different form August 26, 2014. It is one in a series of information detailing the history of Central Michigan University in celebration of the 125th Anniversary of the institution. Be sure to check out the official 125th Anniversary website – http://anniversary.cmich.edu – and the Clarke’s upcoming exhibit, opening in September, for more great stories.